Orange Park, FL., – 71 year old Harry Davis is one of the millions of people watching the Winter Olympics. Not only does he know what it feels like to compete, but he also knows what it feels like to win. Recently, Davis won the gold at the Senior Games despite having undergone quadruple bypass surgery just one year earlier. 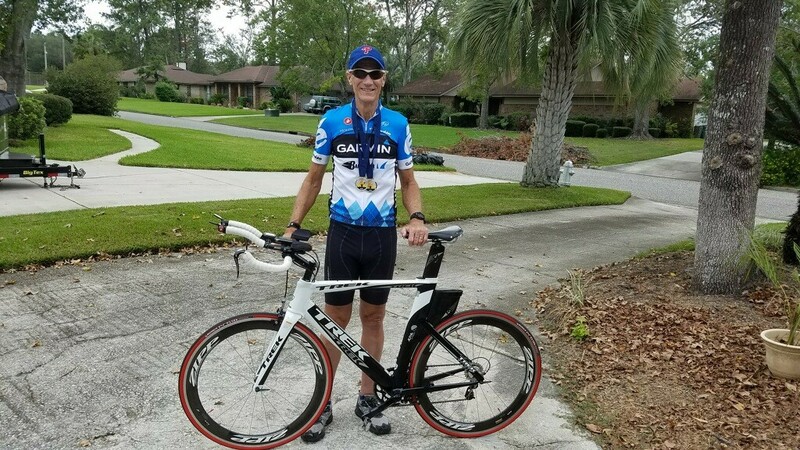 Davis, a runner for years turned to cycling after his knees gave out. Cycling 50 miles at a time twice a week, Davis turned to competitive cycling which has now earned him five medals. The Senior Games is a multi-sport competition for seniors aged 50+ from the U.S. The competition includes a local competition locally called Jacksonville Senior Games, state competition Florida Senior Games and a National Senior Games. Davis’ heart trouble started in 2016 during a bike ride. At mile 20 of Davis’ typical 50 mile ride he began feeling what he thought was indigestion. He tried to self-treat with antacids but the burning did not go away. That is when he turned to his family physician. After hearing the symptoms and knowing his family history of heart disease, Dr. Peter Pitchocchi recommended Davis undergo an EKG, which showed irregularities in his heart. He also recommended Davis see a specialist. Davis made an appointment with Cardiothoracic Surgeon Dr. Nathan Bates to discuss the results of his EKG. During this time, Davis discovered he had plaque buildup around his heart. “I’ve never smoked, always exercised and lived a healthy life but you can’t beat genetics. I had no symptoms. I was mowing my grass and doing everything I normally did. Cycling saved my life,” said Harry Davis. Dr. Bates was familiar with the condition. Right away Bates performed quadruple bypass surgery on Davis at Orange Park Medical Center. Quadruple bypass surgery, a surgery where blood vessels are taken from another part of your body to go around, or bypass your blocked arteries reduces your risk for heart attack. Bates says Davis’ story is a reminder about the importance of keeping up with your annual check-ups and discussing symptoms and family health history with your physician. Just six months after surgery, Davis won a bronze medal in the 5K at the Jacksonville Senior Games. 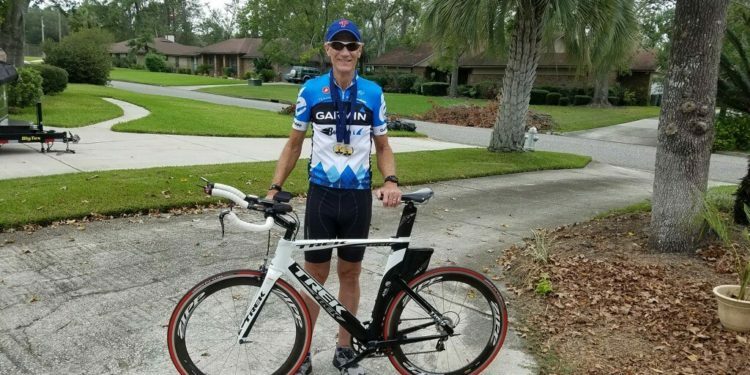 In 2017 he took home two golds from the Jacksonville Senior games for the 5K and 10K. He then went on to bring home two bronze medals at Florida Senior Games. In 2018 he will be competing again to qualify for the National Senior Games to be held in 2019, occurring every two years. “Quadruple bypass surgery is not the end. I’ve had my best times since I got my new pipes,” said Davis. Cholesterol plaque buildup on the artery walls and blood clots are the leading cause of death in the U.S. The growth of plaque happens slowly and blocks the blood flow through the arteries creating the risk of sudden rupture causing heart attack or stroke. Davis wants to share his story to help others recognize symptoms and bring awareness to heart disease. Orange Park Medical Center, serving Clay County and its surrounding communities, is a full-service, acute care hospital with 317 inpatient beds. Orange Park Medical Center is a Joint Commission Top-Performing Hospital, ranked as one of the best hospitals in the country for heart, lung and surgical care. For more information about services, facilities and physicians, please visit OrangeParkMedical.com. Has he seen the mibie, Forks Over Knives? It’s on the internat and Netflix. The movie is packed with research based evidence of people who have had this condition and were almost dead with the build up of plaque on the heart. They had also had by passes. I’m confused why his doctor didn’t reccomed changing his diet to a whole plant based diet to try to avoid the surgery. I realize doctors are only given less than two semesters in nutrition. Sometimes, I wonder if they need to be reeducated about the benefits of foods. Genetics plays less than 7% of a persons entire body and most every condition is thrown off on genetics.DNA has a tendacy to reverse it’s self based on what we eat and environmental coditions, etc.